Great country of north-western Africa, along the median course of the River Niger, without way out on the sea. It is a very poor and very beautiful nation, with spectacular landscapes as the imposing rocky cliff of the region of the Dogons to Bandiagara; with unique architectures as the Great Mosque of Djenne; with mythical places as the mysterious Timbouctou. To a large extent the country is steppe and desert, especially in the northern band, where the thick of the center-southern Sahara are extended. 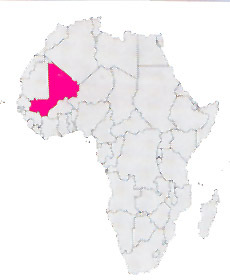 More to south it is more habitable, above all along the course of the great river: the Niger, but density is inferior however to 10 abs / Kmq. The capital Bamako, the only true (about 1.500.000 inhabitants) city, is situated in the extreme south-western part of the nation, obviously on the River Niger.